Habitat: The plant is native to Europe. It prefers well drained, loamy and moist soils. Blackberry is very tolerant of poor soils. 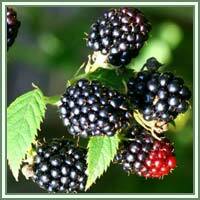 Description: Blackberry is a perennial shrub. It has sprawling, woody and thorny stems. They can reach the height of about 5 meters. It has dark green, hairy leaves, toothed along the margins. Leaves grow in clusters of three to five. Flowers are white to pale pink, appearing from late summer until autumn. Fruits are the well-known fleshy, black berries. Parts used: Leaves, fruit, root. 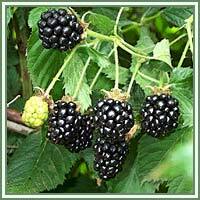 Medicinal use: Blackberry is considered to be an astringent, depurative, diuretic, tonic and vulnerary. The plant was usually used to treat dysentery, diarrhea, hemorrhoids and cystitis. Nowadays Blackberry is widely recognized as a powerful antioxidant, and it can be used as prevention against heart disease, cancer and eye degenerations. A decoction made from the leaves is used in treatment of diarrhea (it helps preventing the excessive loss of fluids). Used externally, leaves are useful in treatments of wounds, sores, scratches, gum inflammations, ulcers and sore throat.